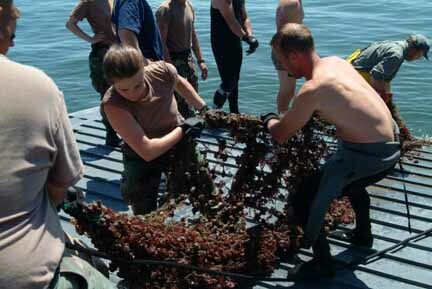 In Puget Sound Washington the Northwest Straits Commission, a civilian regional organization created by federal statute, was achieving significant results working with commercial divers to recover derelict fishing gear from the bottom of the seafloor. While already successful given their resources, the overall problem exceeded the resources available, and some nets were at depths beyond which the civilian divers could recover under OSHA rules. Thankfully there is a training mission overlap for military divers and the watercraft operators who support them and the net recovery project needs of the civilian agencies. However, how to attract military teams to Washington State to do their training, and therefore implement the win-win salvage work, remained a daunting question. While Will Nuckols, Principal at W.H. Nuckols Consulting, already possessed a robust network of military partners, engaging new teams in the effort was a time consuming, and accordingly a resource intensive, effort. Associating national media coverage of the first few military teams who came to work on this mission proved to be a cost effective way to advertise the opportunity to come to Puget Sound for annual diving and watercraft training. Initially successfully targeting national print media and securing a page 3 USAToday story, civilian media was used to reach the market in the U.S. Following those successes the effort to target the military specifically, and through that process reach sailors and soldiers not just at home but also those stationed overseas but scheduled to return to the U.S. soon. Soldiers Radio and Television and the Army Media Center were crucial partners in that effort. Initially using stories produced for video where Will Nuckols served as the multi-agency spokesperson during interviews, subsequent efforts included W.H. Nuckols Consulting preparing scripts which were used in the Army's production of stories on this topic for radio. Developing a communications vision, attracting significant media interest, providing key resources including b-roll stills and video, serving as a federal agency spokesperson during interviews, developing background information and scripts for news segments, managing multiple agency communications teams, and leveraging initial successes for achieve continued media coverage are all tasks which William Nuckols, Principal at W.H. Nuckols Consulting, executes with a high level of professionalism.